Western blot analysis of extracts from various cell lines using FAK (D5O7U) XP® Rabbit mAb (upper) or α-Actinin (D6F6) XP® Rabbit mAb #6487 (lower). Immunoprecipitation of FAK from RD cell lysate. Lane 1 is 10% input, lane 2 is Rabbit (DA1E) mAb IgG XP® Isotype Control #3900, and lane 3 is FAK (D5O7U) XP® Rabbit mAb. 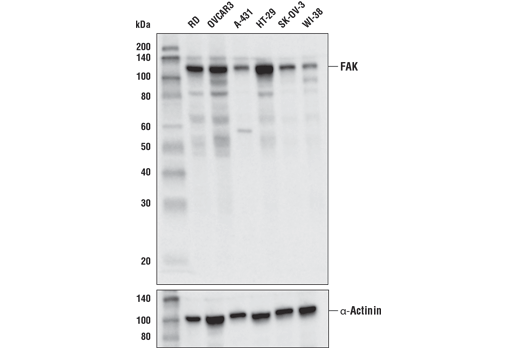 Western blot analysis was performed using FAK (D5O7U) XP® Rabbit mAb. Mouse Anti-rabbit IgG (Conformation Specific) (L27A9) mAb (HRP Conjugate) #5127 was used as the secondary antibody. 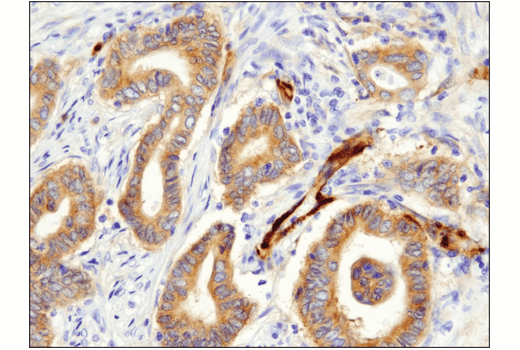 Immunohistochemical analysis of paraffin-embedded human colon carcinoma using FAK (D5O7U) XP® Rabbit mAb. 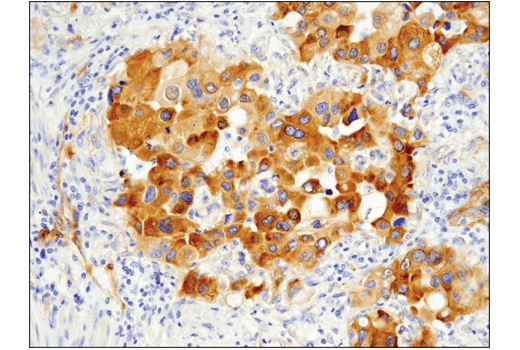 Immunohistochemical analysis of paraffin-embedded human lung adenocarcinoma using FAK (D5O7U) XP® Rabbit mAb. 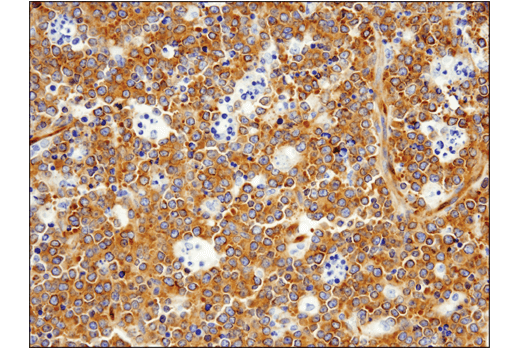 Immunohistochemical analysis of paraffin-embedded human non-Hodgkin's lymphoma using FAK (D5O7U) XP® Rabbit mAb. 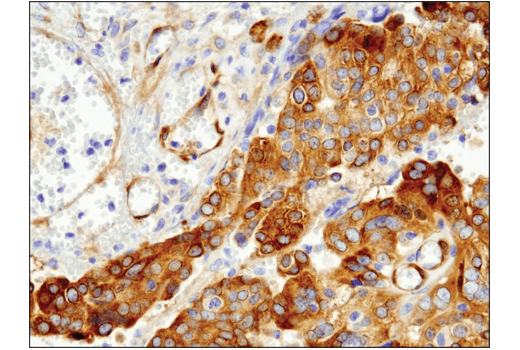 Immunohistochemical analysis of paraffin-embedded human serous papillary carcinoma of the ovary using FAK (D5O7U) XP® Rabbit mAb. 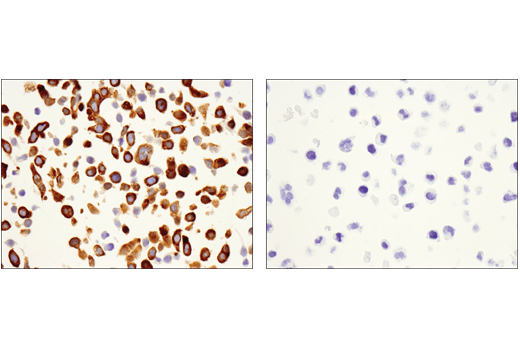 Immunohistochemical analysis of paraffin-embedded HT-29 cell pellet (left, positive) and RPMI 8226 cell pellet (right, negative) using FAK (D5O7U) XP® Rabbit mAb. 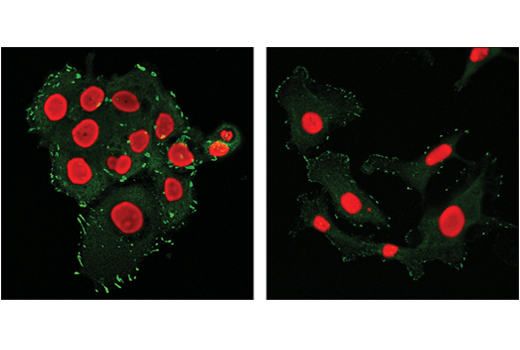 Confocal immunofluorescent analysis of OVCAR3 cells (left, high-expressing) and SK-OV-3 cells (right, moderate-expressing) using FAK (D5O7U) XP® Rabbit mAb (green). Red = Propidium Iodide (PI)/RNase Staining Solution #4087. 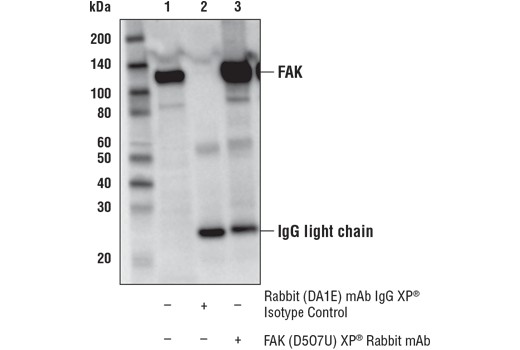 FAK (D5O7U) XP® Rabbit mAb recognizes endogenous levels of total FAK protein. Immunofluorescence was performed on cells plated on tissue culture grade plastic. We did not detect FAK signal on uncoated glass slides. Monoclonal antibody is produced by immunizing animals with a synthetic peptide corresponding to residues surrounding Val793 of human FAK protein. Focal adhesion kinase (FAK) is a widely expressed cytoplasmic protein tyrosine kinase involved in integrin-mediated signal transduction. It plays an important role in the control of several biological processes, including cell spreading, migration, and survival (1). Activation of FAK by integrin clustering leads to autophosphorylation at Tyr397, which is a binding site for the Src family kinases PI3K and PLCγ (2-5). Recruitment of Src family kinases results in the phosphorylation of Tyr407, Tyr576, and Tyr577 in the catalytic domain, and Tyr871 and Tyr925 in the carboxy-terminal region of FAK (6,7). Schaller, M.D. et al. (1994) Mol Cell Biol 14, 1680-8. Cobb, B.S. et al. (1994) Mol Cell Biol 14, 147-55. Chen, H.C. et al. (1996) J Biol Chem 271, 26329-34. Zhang, X. et al. (1999) Proc Natl Acad Sci U S A 96, 9021-6. Calalb, M.B. et al. (1995) Mol Cell Biol 15, 954-63. Schlaepfer, D.D. et al. (1994) Nature 372, 786-791. CST is a trademark of Cell Signaling Technology, Inc.